David Carlson of Brighton marched in the Veterans for Peace parade in 2013. The organization has been barred from joining the main St. Patrick’s Day parade in South Boston, so it follows with its own separate march. So after a quarter-century of to and fro, gay people will march openly in the St. Patrick’s parade in South Boston. It’s a big deal. One more reminder of how much this town, not to mention The Town, has changed. Forgive Pat Scanlon if he doesn’t run to the top of Dorchester Heights and rejoice over the newfound embrace of inclusivity among the Allied War Veterans Council members who organize the annual march in Southie. 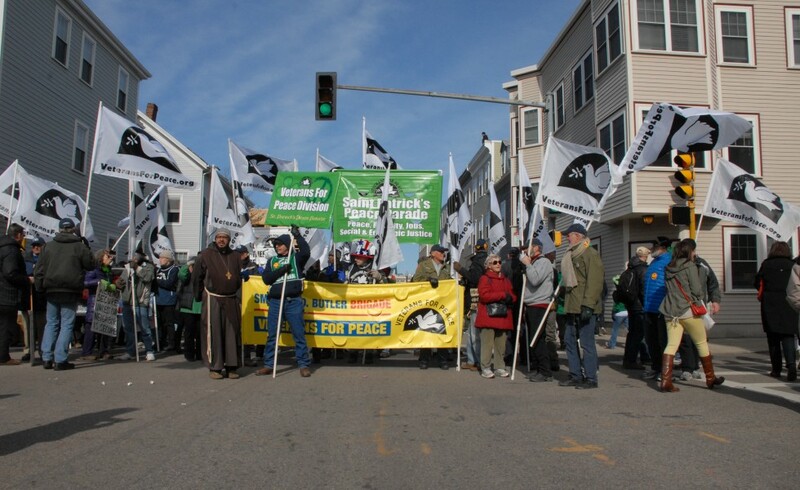 When it comes to the Southie parade, peace is the last taboo. Scanlon heads a group called Veterans for Peace, which, just as the name implies, comprises a bunch of people who have served their country in uniform but have come to the conclusion that, as Marvin Gaye once put it, war is not the answer, for only love can conquer hate. “We are wicked proud of . . . finally breaking that wall,” said Sylvain Bruni, president of Boston Pride. Don’t get him wrong: Pat Scanlon is positively over the moon, because he and his group have wanted lesbian, gay, bisexual and transgender people included in the parade for years. And he and they take a certain pride that both a group of LGBT veterans called OutVets and, more remarkably, the gay rights organization Boston Pride, will march on Broadway. That said, the people in Veterans for Peace now find themselves outside the parade tent, looking in. “We’ve been told that the words veteran and peace should not be associated together,” Scanlon said. That’s nonsense, says Brian Mahoney, a leading figure in the Allied War Vets. Mahoney said he met with Veterans for Peace and told them they could march with their banner but they wanted more. Mahoney said they wanted to knock America. “There is a time to knock America, and there is plenty to knock, but this is not the forum for that,” Mahoney said. Scanlon said leading figures of Boston Pride called him after they learned they would be allowed to march. His group had vowed to boycott the parade as long as gay groups were excluded. The solidarity was not a two-way street. “They were afraid we’d have hard feelings. I don’t, but some of our members will,” Scanlon said. On Saturday, Mayor Marty Walsh was at one of the really worthwhile St. Patrick’s-related events, the 9th annual breakfast to benefit the Mary Ann Brett Food Pantry at Blessed Mother Teresa’s in Dorchester. Walsh worked long and hard to make Sunday happen. He hopes Veterans for Peace are included next year. There were many others behind the scenes, like Ed Flynn, a Navy vet and son of former mayor Ray Flynn. And while no one in so-called progressive circles likes to admit it, there are some men on the Allied War Vets who are really decent guys. Then there is 84-year-old Wacko Hurley. He embodied the old guard among the parade organizers. At the veterans posts in Southie, they call him Wacko-Nine-O, because Wacko was leading the Allied War Vets 20 years ago when they secured the unanimous backing of the US Supreme Court saying they were perfectly within their constitutional rights as a private group to bar whomever they liked from their parade. But Wacko’s health has been in decline and he couldn’t make the vote on whether to let OutVets march. As it was, the measure passed by one vote. Wacko and one of the most outspoken local members of Veterans for Peace, Tony Flaherty, used to be drinking buddies back in the day. Wacko stood up as Tony’s best man and godfather to Tony’s firstborn. But Tony got sober and they drifted apart in more ways than one. When Tony Flaherty came back from Vietnam, he was implacably opposed to war and militarism. After US forces invaded Iraq, Tony Flaherty found himself asking his old pal Wacko Hurley for permission so Veterans for Peace could march in the St. Patrick’s parade. Wacko told Tony to get lost. Oh, and he called Tony a commie, too. In Southie, it’s always personal. And it still is between the Allied War Vets and Veterans for Peace. Both accuse the other of being deeply disrespectful. But it’s also philosophical. Military service and war affected them very differently. I like people in both groups, and I’ve got to be honest: it kills me to see vets beating each other up. They’ve both been in the same places. They just came out in different spots. Pat Scanlon is not from Southie. He grew up in West Philadelphia, and West Philly is a not so different place. He understands tradition and clannish ways. What he can’t understand is why any veteran would oppose another veteran marching in a parade. Scanlon was an Army intelligence officer in Cambodia who saw the folly of war firsthand, the civilian deaths that killed a little bit of his soul. The other day, while everybody was talking about the brilliant progress signified by the admission of openly gay people to the Southie parade, Scanlon was with a buddy, a vet who has a Silver Star, a boatload of other medals, and 27 confirmed kills in Vietnam. Those confirmed kills led his buddy to confirm his belief that wars extract far too high a price from those who fight them, let alone those who die in them. “So, you’re telling me, me and my buddy can’t march in that parade?” Scanlon asked. “I’m a veteran; I grew up in an Irish Catholic family. I was born on St. Patrick’s Day, and you’re telling me I can’t march in that parade? The real lie is that war produces a monolithic veteran.